With my Green Monster madness going on recently, I’ve been coming up with some pretty interesting concoctions. Seriously, I have about 3 recipes queued up over here. 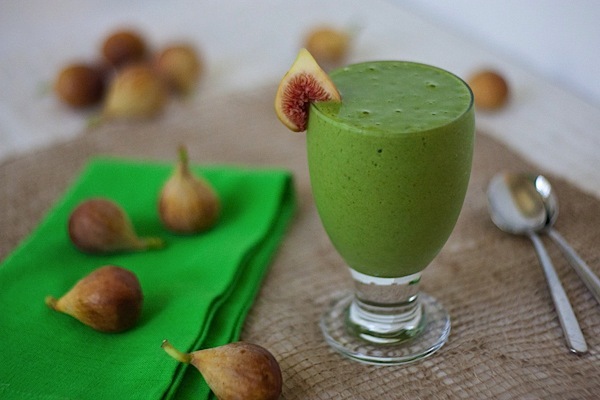 Anywho, none had more interesting, or shall I say a surprising, taste than my latest – Figgy Green Monster Smoothie. 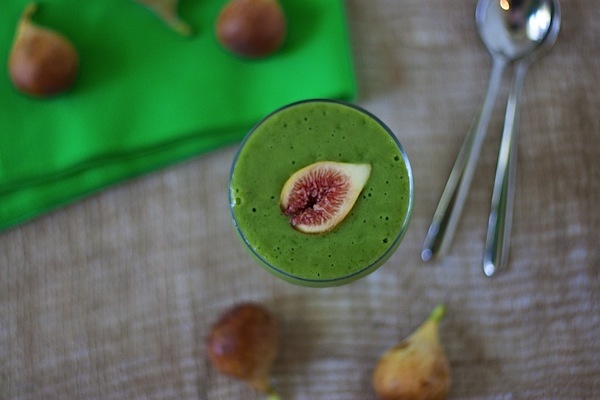 It’s a fig smoothie that tastes like cake batter. The smoothie had zero elements that I would normally use to make a cake batter flavor and yet it tasted like cake batter! Ok, maybe it’s just me. You guys know I like to make my cake batters on the healthier side. But I honestly took the first sip after blending this smoothie up and thought…hmm…cake batter? I came up with the idea to make a fig smoothie because my friend who has a fig tree brought in a bunch to give me. Score! Unfortunately, even without teaching Zumba, my schedule has been hectic, so I haven’t exactly had a bunch of free time to experiment with a cool recipe. 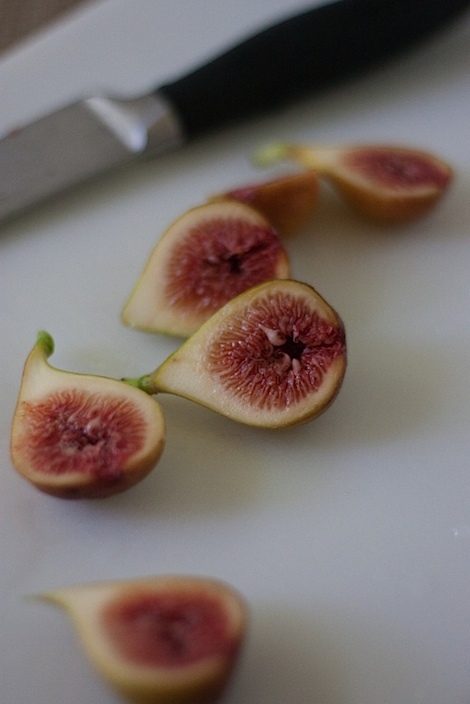 So…What could I do quickly with figs? Why not put it in a smoothie, right? And as it turns out, figs in a smoothie are a good thing. Click here to get *free* The Chic Life updates! 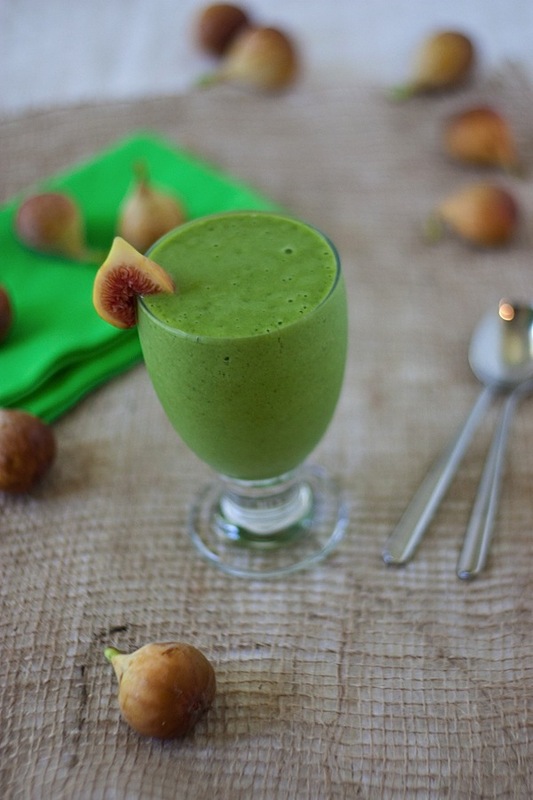 Reader question: Figs were an ingredient that I never really expected to put into a smoothie. What’s the most unexpected thing you’ve put into a smoothie? Did you like it? Thanks for posting Diana, can’t wait to try this one out! Healthy cake batter for breakfast? Yes, please! I love and appreciate your blog, but, another green monster post? I feel like this is the 3rd in a month. I know! I’m on a roll! lol 😛 They’re just so good! Most people seem to recommend pairing figs with prosciutto, which actually doesn’t sound that great to me. hehe. Figs and prosciutto are wonderful the wow factor is crazy with the opposing flavors of sweet and salty. you should try it it’s a total indulgence. I looooove new green smoothie recipes! Thanks for sharing girl! This looks really unique and delicious! everytime I bake cake i land up digging my finger and scoop some of those batter and eat. This looks lovely and is it taste like cake batter .. bring it on! Lol! Cake batter is pretty irresistible! What’s your favorite kind of cake to make? Very unique mix Emily! Do you add any other liquids to it like milk or soy milk? Nope, that’s it! I think the original came from the Raw Food Real World cookbook. My boyfriend makes it all the time for his breakfast. i did like it..just added sum dragon fruit fr extra sweetness..tasted good!! Could I use dried figs in this recipes. I always have those on hand. I love your green smoothies, thank-you for all your work. Just wanted to thank you for this recipe, I have made it a few times now and it is excellent! I have a fig tree and was looking for ways to use them in my smoothies with little luck until I found this gem 🙂 My husband even asked for seconds, and he usually makes gagging faces at me when I am drinking my green smoothies. Only note on the recipe is that I used unsweetened almond milk so the first time I added some vanilla with the stevia drops and it was perfect, the second time I forgot to put in the vanilla and it was still really good but I think the vanilla definitely helps give the “cake batter” flavor so I would recommend! I also added chia seeds the last time I made it, I like them in all my smoothies. Thanks again, so great! That’s wonderful! So glad to hear you’re enjoying the recipe so much. Makes me wish I had some fresh figs around! 🙂 Thanks, Jen! I love green smoothies and had some frozen figs on hand. Found your recipe, tried and and fell in love! Thanks for sharing it!